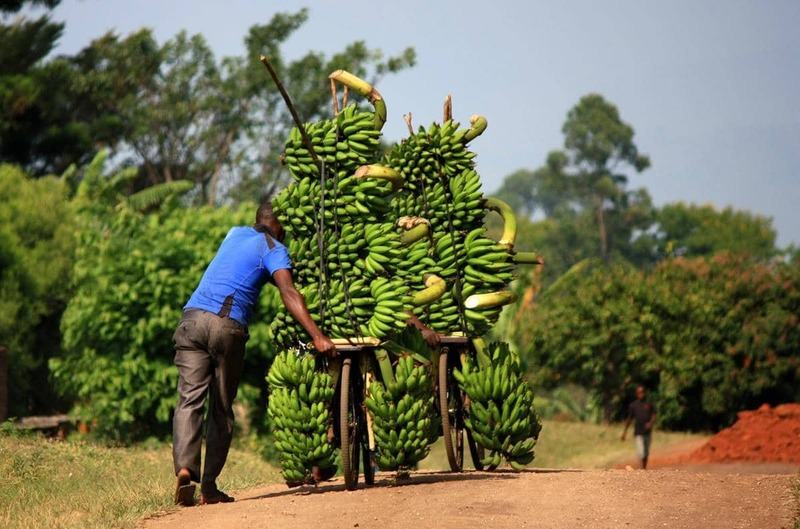 Uganda might be the world’s biggest producer of plantains, but it certainly is no banana republic. 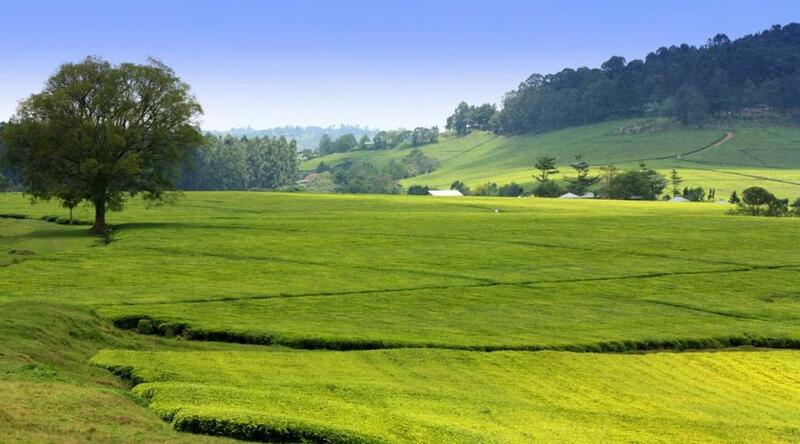 Being a fertile country it exports coffee, tea, tobacco and cotton. I will remember Uganda for its acres of crisp green tea plantations and everywhere you look, banana plantations, with coffee bushes in between. 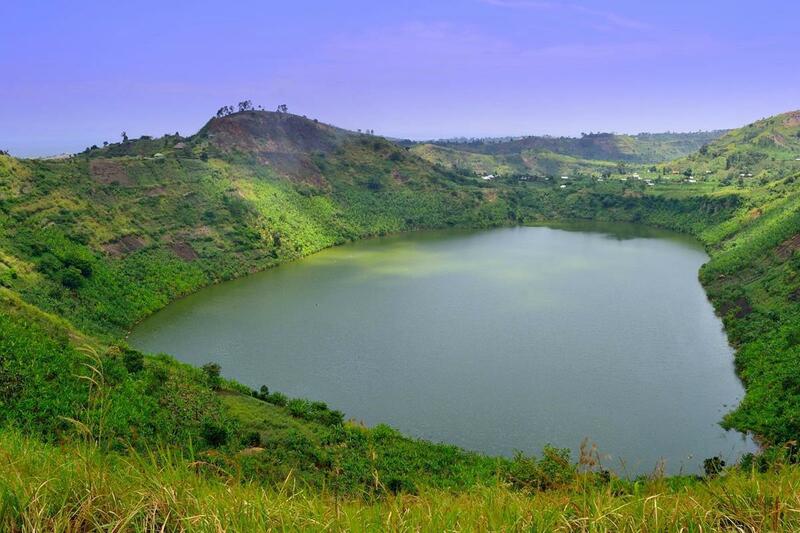 However, what made Uganda really special for me were the tea plantations, crater lakes, the White Nile River, and the wide variety of primates. Heading south from Lake Nyabikere, we had hoped to see more of the Kasenda cluster of crater lakes but unfortunately none were visible from the road. We were very excited, however, to cross the equator and stopped to make the most of the landmark. 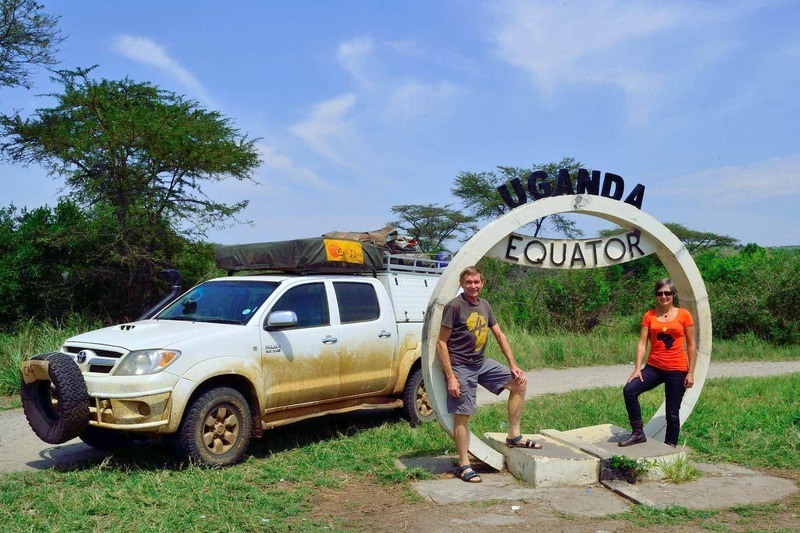 On the equator in Uganda! The main road south bisects the Queen Elizabeth National Park and passing through we saw small herds of elephant, buffalo and impala. As we meandered through the hills we passed a perfect example of yet another crater lake. Bananas trees covered the land as far as the eye could see and we could not help but wonder who eats them all. Our host at Lake Nyabikere told us that many are fermented and then distilled into gin, of which he gave us a taste. It was quite harsh on the palate and nose and more to Pete’s liking than mine as it reminded him a bit of Grappa. We saw many people carrying heavy bunches of bananas to town, presumably to be distilled. As we neared the Bwindi Impenetrable National Park we passed by miles and miles of crisp green, neatly trimmed tea plantations. 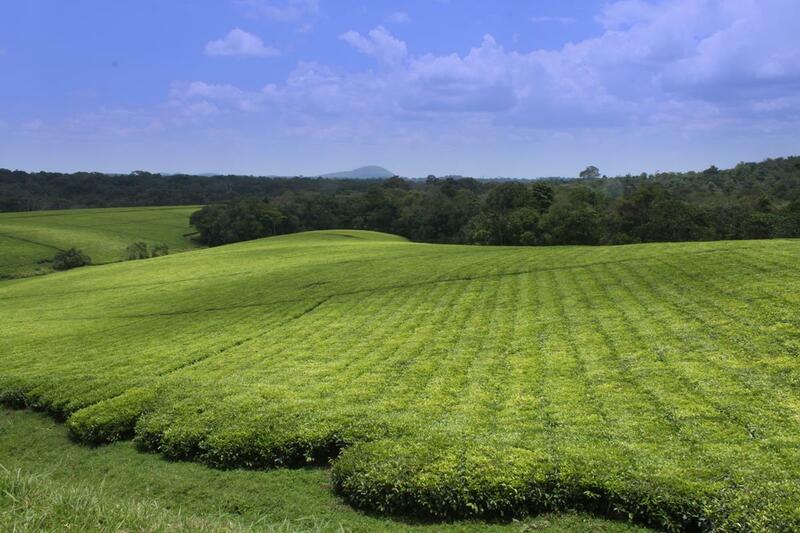 The bright green tea bushes of the Ankole Tea Estate. 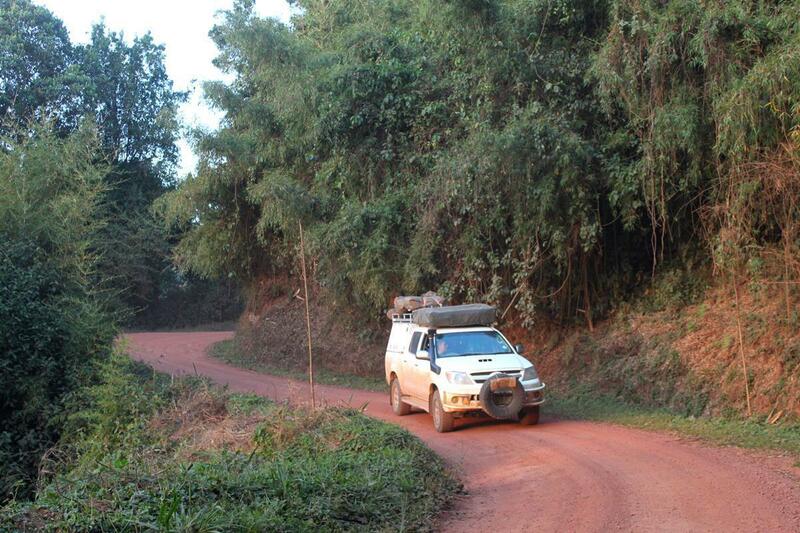 The drive into the Bwindi Impenetrable National Park was very pleasing as the good dirt road wound through thick forest. We were lucky to catch glimpses of black-and-white Colobus monkeys and dark brown forest duiker. Up in the bamboo section of the Bwindi Forest. We were hoping to camp in the forest, but closer examination of the map showed that this deeply dissected park is indeed hardly penetrated by roads. Only a few routes fringe the park and they also service the villages on the outskirts of the park. It turned out that the community camp that we were heading for was right in the middle of a crowded little village. As we had our hearts set on a quiet camp spot, we opted to retrace our steps towards Kabale and onto Lake Bunyonyi. We arrived at the Bunyonyi Overland Resort after 20:00, tired after a long day’s drive. We had met a tour guide earlier at The Haven who mentioned that it is sometimes possible to buy Gorilla Trekking permits at a discounted rate of US$150-200 which have been pre-issued to travellers who then didn’t show up. Both of us felt that forking out US$600 to spend one hour with the gorillas wouldn’t provide value. However we felt that being here we owed it to ourselves to do the gorilla trek if we could somehow obtain the less expensive permits. I inquired at the resort and one of the staff members set up a meeting for later in the day with Katete Kishatura, who is an official Gorilla Tracking & Game Park Driver, according to his business card. We were extremely excited that we clinched the deal for US$200 each. 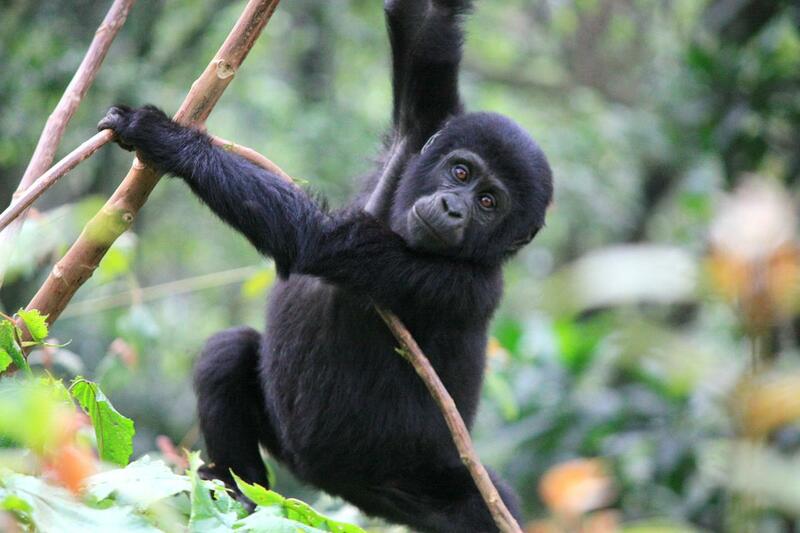 We would join another couple and be driven to Bwindi Impenetrable Forest where we would get our permits and meet the ranger who would take us to see the Gorillas. Mr. Kishatura asked us for some upfront petrol money (US$30 each), which also included his fee. When he picked us up at 13:00 the next day, we joined three medical students from Belgium, making six a tight fit in the Toyota Tazz. Arriving at the gate we were surprised when Mr. Kishatura instructed us to say, if asked, that we were on our way to Queen Elizabeth National Park. We digested this as we drove on, intrigued with our driver making frequent phone calls. About 4km before the next police check point he mentioned that we would be meeting our guide along the road as he had already located the gorillas. We stopped and a green rain garment clad figure appeared, introducing himself as Ezra. Warning bells began to ring after Mr. Kishatura asked Pete to hand over the balance of the funds to the ranger, who instead seemed much keener to get us off the road. We trudged east down a steep slope, following cut marks, through dense growth until we reached the bottom of a valley and then walked south. Neither of us had had time to put on our long trouser legs when we were ushered out of the car and regretted this when the swarms of mosquitoes and fire ants descended. We had struggled through thick forest for about 45 minutes when Ezra stopped to show us some gorilla droppings and a few hundred metres further on said he could smell gorilla urine. He smiled, telling us that we were about three minutes away from the animals and, as we were now guaranteed to see them, we should pay. It was bizarre, each of us counting out a fist full of notes in the middle of the jungle, which he casually deposited in his raincoat pocket. It was then apparent that this was not the official method of obtaining discounted permits! Nevertheless, committed, we were thrilled to hear branches snapping ahead. A quick briefing informed us that if a gorilla charged we shouldn’t run but stay in a group, crouch and scratch the ground. If we had to cough or sneeze we should cover our mouths and noses and turn away. Then, with the start of our one hour’s viewing time noted, we moved ahead to view the group of 13 individuals. Ezra imitated the gorilla welcoming sound… and then we saw him! 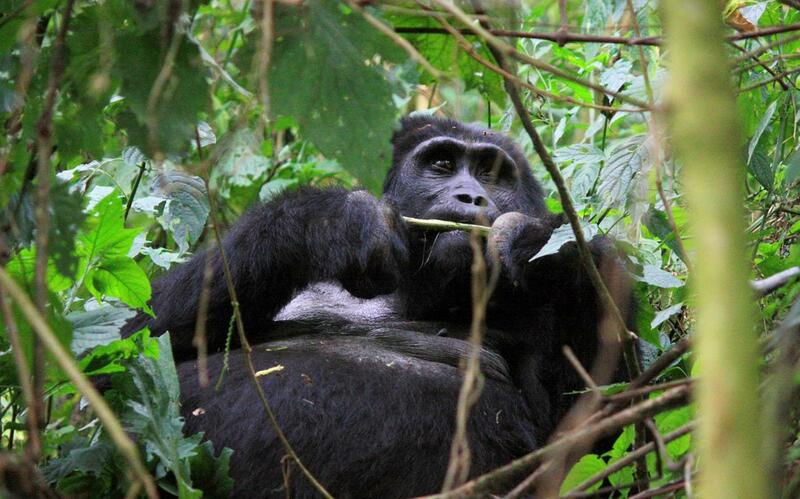 A gigantic Silverback sitting in the thick growth barely seven metres from us! 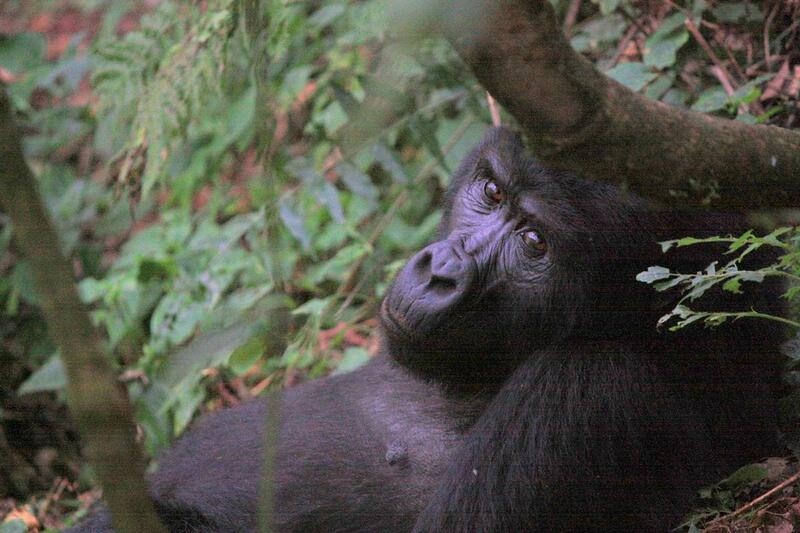 A Silverback lazily nibbling on the vegetation. The group was spread out and each time we approached another family member, Ezra would imitate the welcoming sound. We were surprised that it wasn’t necessary to speak softly. Also luckily, we didn’t have to move quietly in the steep bushy terrain, as these animals weren’t in the least disturbed by our presence, as long as we didn’t venture closer than about five metres. The Silverbacks were huge, with thick black fur and silver colouring on their lower backs. Enormous, thick fingered hands, about three times the size of a man’s, plucked at the tender undergrowth around them as they fed. Now and then they would eye us lazily and then go back to nibbling the vegetation, occasionally emitting noisy bowel movements; the consequence we learnt of their feeding since early morning. Each creature kept moving on every few minutes, so we did likewise, climbing and descending the steep slopes, seeing females, a Blackback and one juvenile. ….whilst her infant swings silently. Apart from the occasional base vocalisation these primates were silent, very placid and, contrary to our hopes, displayed no social interaction. With five people all vying for clear photographs in the low light and thick undergrowth, their dark colouring made this even more challenging without wide aperture lenses. The hour flashed by and we started the sweaty trudge back uphill to the road, pausing at intervals to catch our breath and for our guide to make phone calls, presumably with our taxi driver. Just short of the road we paused once more where he asked us to excuse him as he needed to take a natural break. Whilst the five of us waited in the forest, one of the students commented, appropriately we felt given the nature of things thus far, that he had gone off to bury his pocketful of cash. On return he said that after we had left he would go to the office and deposit our payments. Then he made sure that we stayed out of sight from the road whilst we waited for our transport, explaining that the gorillas were important to the local community and they didn’t want anyone learning of their location in case they would visit them without paying or worse, poach them. Tired and rather thoughtful of the day’s events we drove homewards. About halfway there, as it was getting dark, we stopped at a crossroad and, without explanation were curtly ordered by our driver to get out. We were told that another taxi would take us the remainder of the way to Lake Bunyonyi, as he was taking the other party back to their town via a shortcut and that our new taxi would ‘only’ cost us 40 000 shillings. Needless to say that we were not happy and made it clear to both drivers that our complete journey was already paid for. However, once under way the new driver repeatedly demanded further payment whilst tearing nonchalantly around blind corners, one hand on the wheel, far over on the oncoming side of the road. At the turn-off to the lake, with about 12km to go, he pulled over and refused to drive further unless we paid more. We reiterated what we had said earlier and just sat there, silent, after suggesting that we go to the police to sort things out. He eventually pulled off, driving flat-out on the rough road while muttering about not getting his money, until we reached the resort. Once there he completely changed his manner and asked us if we would like to use his services the next day. The next morning we took a scenic route, initially north-west, into Rwanda, hugging Lake Bunyonyi, rather than the direct route from Kabale. We greatly enjoyed the drive next to the lake and through hilly, cultivated countryside. 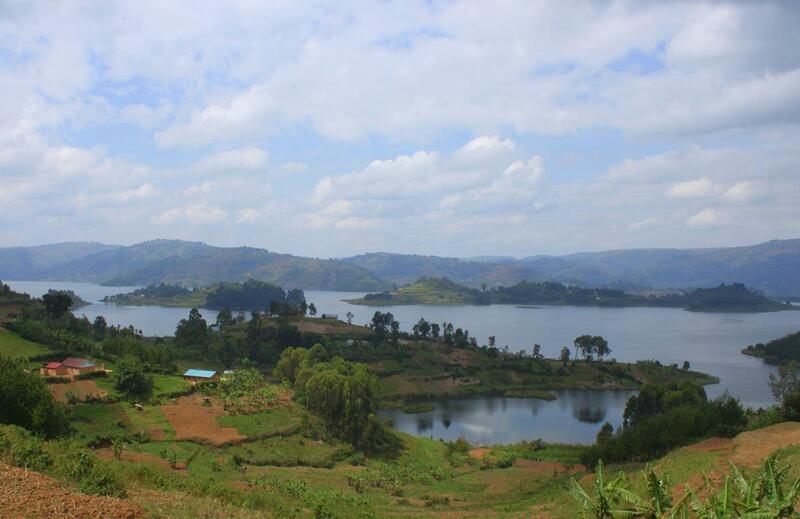 Lake Bunyonyi has several islands. 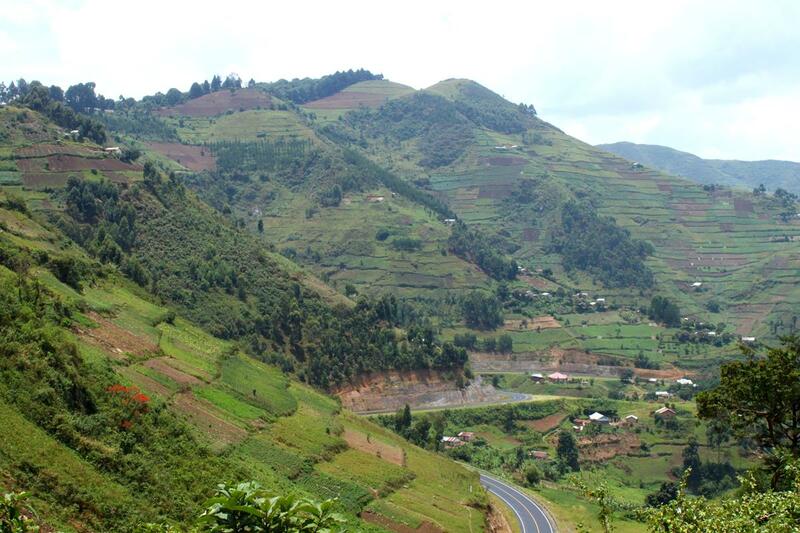 Descending down a beautiful pass on the way to the Cyuve border crossing between Uganda and Rwanda. Wat ‘n ervaring. Die skelm boggers is ook orals! Bly julle kon die gorillas sien al was dit onder goor omstandighede. Dankie vir julle eerlike joernalistiek. Dit gaan almal wat in daardie rigting toer se lewens baie vergemaklik met voortydige waarskuwings. Ek en George het besluit om nie ons voertuig te laat verander nie want ons het die grootste geskenk ooit gekry! Vriende van Namibie het vir ons hulle volledig toegeruste Bushwakka GEGEE! Ons is buite onsself van opgewondenheid en gaan hom die naweek uitprobeer. Pas julleself op en geniet die res van julle rit. Karin, at least you saw the Gorilla’s. Ohhh, Africa at its best. Sad to hear that exploitation and corruption is also the order of the day. I am sure this kind of action is not contributing to conservation as valuable funds are disappearing into the pocket of a few opportunists. Another example to tourism destroying the characters of the locals.